The H2O Sporting Ring of Fire Water Trampoline / Bounce Platform is a fun and safe island for everyone to swim out to. No more worrying your kids slipping and hurting themselves on wooden docks that cost just as much. Now they can bounce the day away while you lay there and tan! 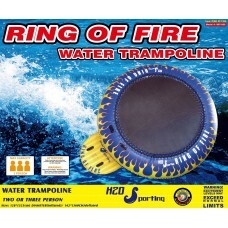 The H2O Sporting Ring of Fire Water Trampoline / Bounce Platform is a fun and safe island for everyo..